Toyota Material Handling is a name widely recognized for product innovation and quality. Toyota forklifts set the bar in the industry in many performance categories and are capable in a wide range of applications and work environments. Whether your business is warehousing and order picking or long-term storage and freight, you’re sure to find a Toyota forklift for sale that meets your specific needs. The latest line of Toyota material handling equipment includes a variety of forklifts featuring an intuitive vehicle management system capable of maximizing efficiency. The selection of available models includes three-wheel electric forklifts, reach trucks, walkie stackers and electric pallet jacks. 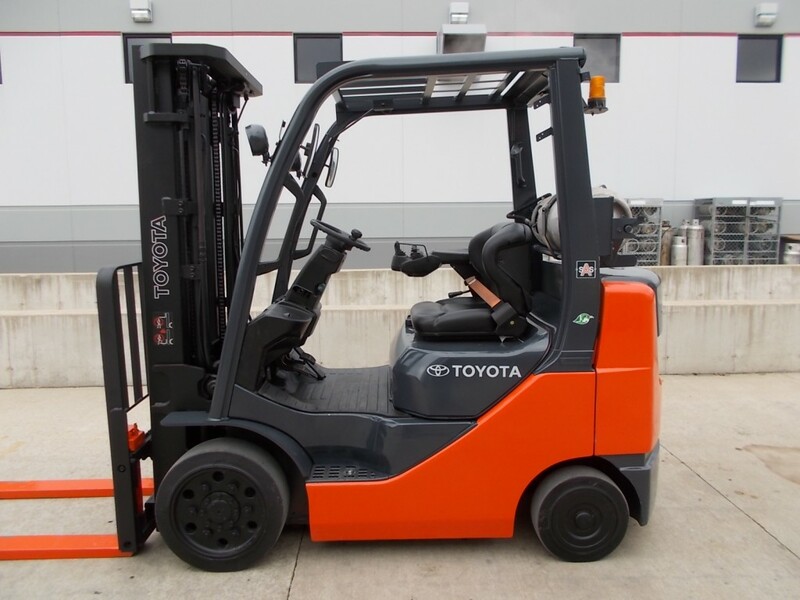 Toyota Material Handling also manufactures electronic pneumatic forklifts and high-capacity IC forklifts capable of handling the toughest tasks. Our experienced team will be happy to assist in analyzing your requirements to identify the Toyota forklift that represents the most efficient and effective fit. Whether you’re operating on a limited budget or don’t require the very latest technology, the used equipment market often makes good sense. As a trusted source with in-house reconditioning capabilities, we take the worry out of shopping used Toyota forklifts. Chicago Industrial personally houses and handles every piece of equipment we carry, so you know it represents a great value in terms of quality, performance and durability. Plus, we stand behind every product we sell with dedicated customer service and ongoing technical support. If you’re not sure a new or used Toyota lift for sale fits your budget, our special financing rates can make investing in the future of your company more affordable. We offer flexible solutions through our affiliation with Direct Capital, a nationwide lender dedicated to helping businesses of all kinds acquire the equipment necessary for achieving their goals. The process of applying for financing is easy, and it only takes a few moments through our secure online system. We serve the material handling equipment needs of the Chicago, IL area, as well as businesses across the country and around the world. With competitive shipping rates, the new or used Toyota forklifts you need are never out of reach. Pick out the model of equipment best suited to your requirements and get in touch with one of our knowledgeable representatives for an accurate assessment of total shipping costs. Don’t expend your valuable resources searching for cost-effective material handling solutions. Partner with Chicago Industrial today for a single, reliable source of Toyota forklifts and lift equipment from other leading manufacturers. Don’t see what you’re looking for in our online inventory? Give us a call at 815-744-8811 for assistance in locating exactly what you need. We’ll be happy to provide a free quote on any new or used Toyota forklift we have in stock.